it has been three months, three months since my last post! let me tell you, home reno's have a way of completely taking over your life. that was not my plan, i honestly thought i was going to be able to do it all when we started our reno, i had no intentions of this mini blogging hiatus but truth be told i think i kinda needed it. not just because i have been super busy with our reno and life in general but my creative juices just haven't quite been there this winter/spring. being creative is kinda hard, it is surprisingly heavy on the mind as you are always thinking of what you want to make next, how to style it, how to shoot it, how to edit it, its physical work for your brain i tell ya. all of my creative juices for the last 3 months have been restricted to our reno, it was a lot, every single detail was up to me from the size of each cabinet to the depth of our shelves to the colour palate to the cabinets handles etc etc etc. don't get my wrong i am incredibly grateful and blessed that paul and i were able to make this reno happen it has just been a lot of work physically and mindfully and so a hiatus was very much needed. next week i am heading to kentucky, ya'll i have my derby hats packed! i am so incredibly excited for this trip i have never been to any of the southern states so it will be fun to drink some bourbon and perfect my ya'll! but mainly i am excited to meet some of my most favourite blogger friends! we have a jam packed weekend planned, one that Lauren from Harvest & Honey has so graciously and beautifully curated for us all. if you remember this was the weekend that Lauren and i had planned to throw a workshop together but we thought about it long and hard and decided that we kinda just wanted to have a fun weekend together with some other friends so we gathered together Hayley from Birch + Berries , Ryan & Adam from Husbands that Cook and Nate from Terminator Kitchen (who can't quite make it to Kentucky anymore but will most definitely be there in heart and spirit) to spend a weekend cooking and laughing and bourbon sipping AND raising awareness for hunger relief and food insecurity! it seriously pulls at my heart strings what Lauren was able to pull together for our weekend. we have some awesome sponsors that are helping to all make it happen as well, the soulful project, kroger and tillamook have so graciously donated everything we need to make the weekend happen including a meal packing event organized by rise against hunger, where we and 30 volunteers are going to be packaging up over 10,000 meals for those in need, like how freakin awesome is that?! as for my recipe, i am seriously so freakin excited to share this one with you guys! they are the best tacos i have ever made at home and the best part they are dairy free, gluten free and meat free and i can guarantee you will please everyone at the table! 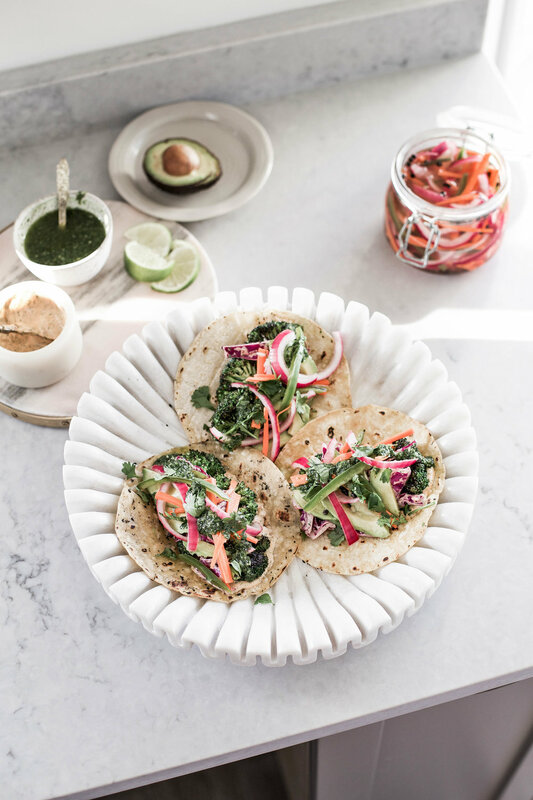 you get sweet and sour from the quick pickled veg, you get soft and crunchy from the chipotle cabbage and avocado, you get fresh and light from the cilantro and lemon herb oil and you get blackened smoky from the charred broccoli, serious flavour explosion. there are a few components to these tacos but they are all really easy to make and once you have them all made you can keep them in the fridge for 3-4 days so leftovers come together in a cinch! not joking, in the past 2 weeks i have made these tacos like 6 times! haha i am almost embarrassed to admit that and at the same time i'm not! i have also made them with a marinated chicken and steak so feel free to add in the meat in you prefer, but the broccoli is my favourite way out of them all! start by making the quick pickled veg: julienne the red onion, carrots and japaleno. place them in a glass jar. in a large mixing cup add the vinegar, sugar and salt, stir until dissolved. pour the vinegar mix over the veg until they are just covered. throw in some whole peppercorns and let sit in the fridge for at least 30 minutes. if you make these the night before they are even better and last in the fridge for up to 5 days. but in a pinch if you give them at least 30 minutes they are ready the day of too! for the cilantro oil: in a food processor add all of the ingredients and blend until smooth, adding enough oil so that the consistency is like a drizzle. for the chipotle cabbage: shred the cabbage and toss with a tablespoon or two of the chipotle mayo. for the broccoli: heat a large cast iron pan on high, cut the broccoli into bite size florets and place in the dry pan. turning the broccoli every few minutes until they start to get nicely charred (blackened), it will take about 8-10 minutes. once the broccoli is done, take out of the pan and turn the heat down to a low medium, one by one heat the corn tortillas until they are lightly browned and soft. 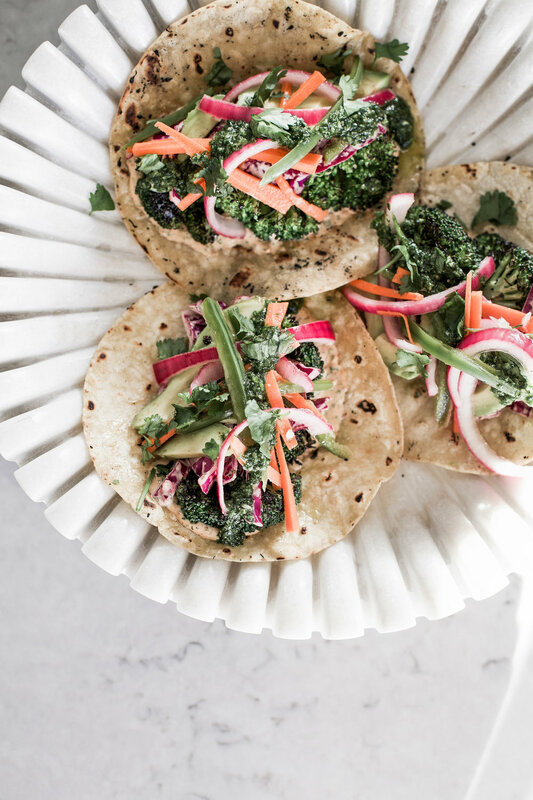 to assemble: spoon a little of the chipotle mayo onto the warm tortilla, add some charred broccoli florets, some chipotle cabbage, a few slices of thinly sliced avocado, some pickled veg, a drizzle of herb oil and a squeeze of lime. grab some napkins and taco away!